While you more often hear about the struggles involved in weight loss, putting on pounds requires a concerted effort, too -- especially if you don't naturally gain weight easily. Certain supplements serve as concentrated sources of calories, which is a good thing for weight gain, since you'll need to eat 250 to 500 calories more than you burn every day to see results. However, some herbal supplements don't offer significant calories, and they might not offer proven weight gain benefits, either. Any supplement can have side effects, so it's essential you talk to your doctor before taking one. Protein powders and shakes are among the most popular weight gain supplements, and for good reason; they're widely available, even at many normal grocery stores, and they taste good. They also supply calories; for example, one commercially available whey protein supplement shake has 150 calories. If you're aiming for a 250-calorie surplus, drinking one of these shakes gets you more than halfway to your goal. Getting enough protein also helps ensure you gain lean mass -- like muscle -- and not just fat as you gain weight, as long as you're also doing an exercise routine geared toward muscle gain. Building up new muscle tissue after each workout requires amino acids, and protein powders typically supply large amounts of the amino acids you need for muscle. One commercial whey protein shake, for example, contains 26 grams of protein. Many powders are also designed to be low in carbohydrates and fat; the same commercial whey protein supplies just 7 grams of carbs and 2 grams of fat. If you need to gain serious weight quickly, a weight gainer supplement might help you reach your goals. Like protein powder, weight gainer supplements supply high-quality protein that can support muscle growth. However, while protein powders often supply large amounts of protein but small amounts of fat or carbohydrates, weight gain powders typically have a more balanced mix of macronutrients -- or, at least, of protein and carbohydrates. For example, one commercially available weight gain powder offers 240 calories per serving, which comes from its 12 grams of fat, 21 grams of carbohydrates and 10 grams of protein. Some weight gainers pack in lots of calories, so they can help you reach your calorie goals. One commercially available weight gain powder supplies 1,340 calories per serving, which comes from 277 grams of carbohydrates, 50 grams of protein and 3 grams of fat. This type of weight gainer might be a good option if you're having trouble even eating enough calories to maintain your weight. However, a weight gainer like this may not be safe for people with some medical conditions, such as kidney disease. You should only take this type of very high-calorie, high-carb, high-protein supplement after you've gotten your doctor's approval. Meal replacement shakes occupy a middle ground between protein powders and weight gainers. They tend to offer a good balance of protein, carbs and fats like many weight gain supplements, but they're generally only a moderate source of calories, unlike weight gainers, which can offer 1,000 calories per serving or more. Meal replacements can help you gain weight by adding calories to your daily intake, and they typically also offer minerals and vitamins that help keep you healthy. For example, one commercial meal replacement shake offers 267 calories per 8-ounce serving, which comes from 7 grams of fat, 43 grams of carbohydrates and 10 grams of protein. The shake also is fortified with nutrients; it supplies B-complex vitamins, iron and more than half your daily value for vitamin C.
The calorie count and nutrient content of meal replacement shakes can vary from brand to brand, as well as between products from the same brand. Always check the nutrition label before you buy, and ask a professional for help choosing the shake that's best formulated for your needs. Not all weight gain supplements provide calories; some contain herbal ingredients that claim to stimulate your appetite or boost your energy, so you can more easily eat enough to meet your calories needs and power through your workouts. For example, one commercial weight gain supplement contains a proprietary herbal blend containing Indian ginseng, amla and fennel. How well these supplements -- or any herbal supplements -- work is up the air, though. Herbal supplements don't have to undergo testing for safety or efficacy before they hit store shelves, explains Brown University, and supplement makers don't have to prove that the supplement actually contains what's outlined on the label. If you're interested in an herbal supplement, talk to your doctor or a nutrition healthcare professional for help finding one that might work for you. Healthy weight gain requires a lifestyle change. No weight gain supplement will deliver the results you want if you don't combine it with a healthy diet and exercise program. That means hitting the gym at least two to three times each week for progressive strength training, ideally, following a program designed by a professional to fit your unique needs, as well as a diet filled with nutritious lean proteins, fruits and veggies, energy-boosting carbs like sweet potatoes and whole grains, plus healthy fats like nuts and olive oil. Boost the calorie content of your meals by adding powdered milk to drinks and moist foods; it has 82 calories per one-third cup of dry powder. You can also make your own shakes at home as a source of calories to help with weight gain. 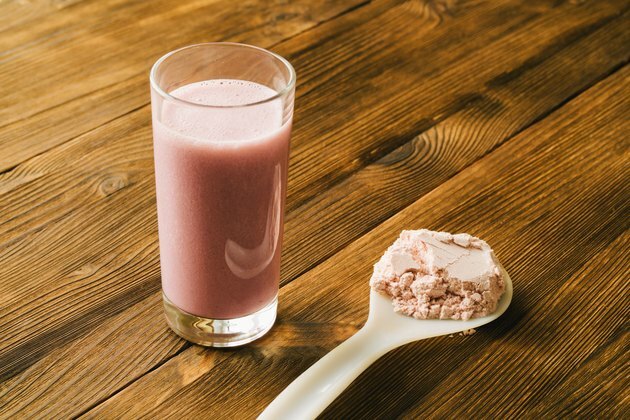 For example, a shake made from whole chocolate milk and an extra-large frozen banana supplies 343 calories, while one made from whole milk, a cup of sweetened frozen cherries and a tablespoon of cocoa powder has 391 calories. Drink one of these homemade shakes a day, and you'd put on a pound about every 10 days, without making any other dietary changes.